Vancouver is an enormous city with lots of see. 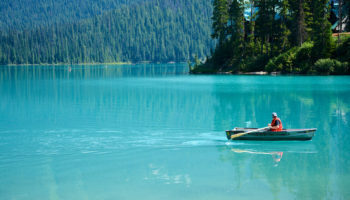 Located between the Pacific Ocean and the Coast Mountains, Vancouver has earned a reputation as a beautiful destination in the Pacific Northwest. It is easy to see why visiting Vancouver is a fantastic choice, but it is a lot harder to figure out exactly where to stay. 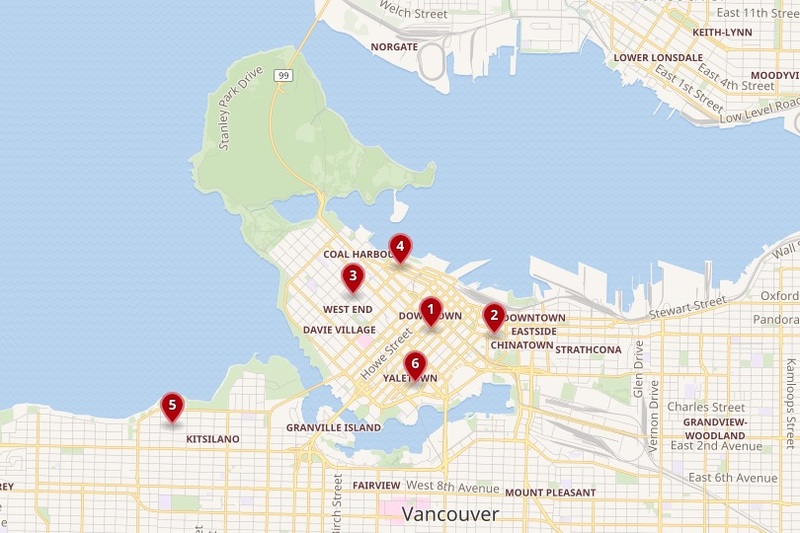 Vancouver is densely populated and sprawling, so there are several great neighborhoods and districts worth exploring. 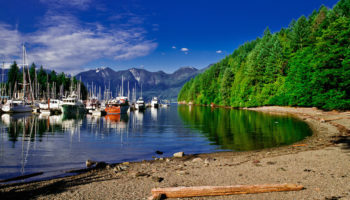 Vancouver is home to lots of outdoor recreation, starting with the famed Stanley Park and its Seawall. 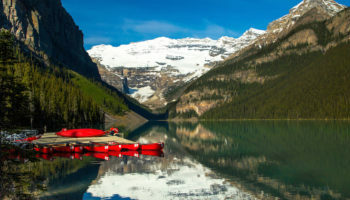 You’ll have chances to go hiking, take boat rides or even ride a seaplane. Vancouver is a melting pot of culture, which means that there are a large array of restaurants serving up everything from sushi to dim sum to authentic Indian curries. There are world-class museums as well as bustling shopping centers. Take a closer look at some of the city’s most exciting neighborhoods to determine where to stay in Vancouver on your next vacation. If you’re visiting Vancouver, then there is a good chance that you’ll spend at least some of your time Downtown. 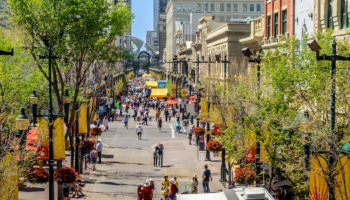 The heart of Downtown is the City Centre. This is where you’ll find the Financial District, so many business travelers opt to stay in hotels Downtown for convenience. Even if you’re traveling for pleasure rather than business, staying Downtown puts you close to all the action. Plus, Downtown is the city’s transport hub. 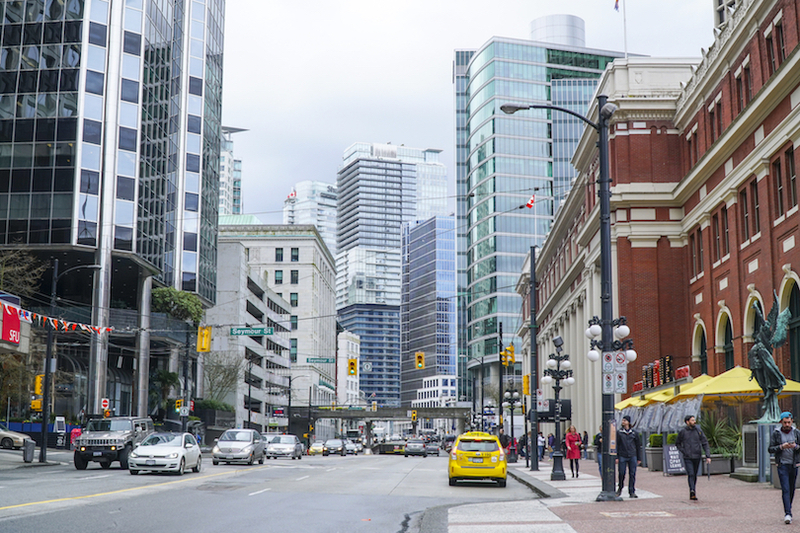 If you are planning any trips around or out of Vancouver, you’ll be close to the Waterfront Station and Burrard Station with plenty of train and bus connections. 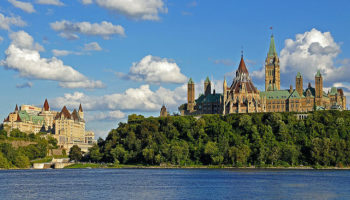 If you’re an architecture enthusiast, you might set off on a walking tour Downtown and spot landmarks like the 19th century Christ Church Cathedral, the Art Deco Marine Building and the Brutalist Harbour Centre. 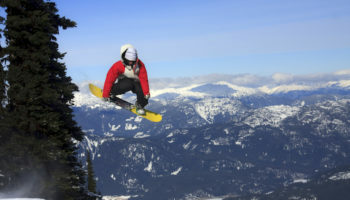 Downtown is also home to major cultural attractions like the Vancouver Opera and the Vancouver Symphony Orchestra. Robson Street is Downtown’s hottest shopping destination, especially if you’re in the market for high-end goods. Hyatt Regency – This is a luxury hotel with some very fashionable and trendy interiors going on, including the spacious, open communal spaces complete with tasteful decor and high ceilings. The rooms boast big, comfortable beds, work desks, and stunning views of Vancouver’s skyline. There’s a heated outdoor pool, as well as a hot tub to unwind in. You’ll also find a restaurant, bar, and grill, and even a Starbucks on the ground floor. The St. Regis Hotel – This may be a locally owned, historic hotel, but inside, it’s all about fresh, clean colors and contemporary comforts. There are two restaurants that guests can choose from onsite, as well as a cozy bar. Each room comes with a desk and seating area. Free international phone calls are provided free of charge. Guests have complimentary access to a nearby sports club. The hotel also goes the extra mile by providing babysitting and other services. Close to two Skytrain stations, The St. Regis Hotel is also situated near Library Square. L’Hermitage Hotel – A boutique hotel that’s located on the corner of Richards and Robson Streets, the surrounding area is perfect for fans of shopping and the theatre; Orpheum Theatre and the Vancouver Playhouse are nearby. Back at the hotel, there’s a heated outdoor saltwater pool and hot tub, providing the perfect place to unwind. Each room features a marble bathroom and large beds. Some even have the luxury of a fireplace for the ultimate in cozy experiences. Gastown and Chinatown are some of the oldest neighborhoods in Vancouver, and the architecture definitely reflects that. It’s a little gritty, a little artsy, a little historic and wildly popular with both locals and visitors. 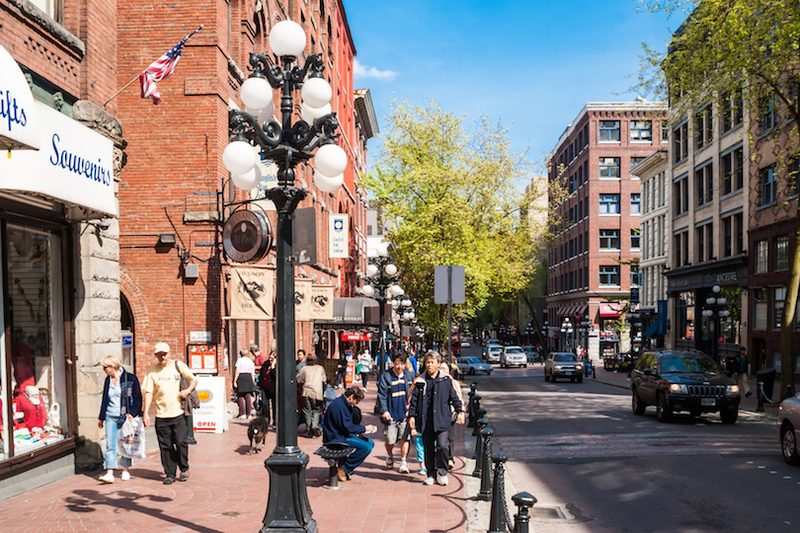 In Gastown, you can walk along cobblestone streets, see restored Victorian buildings and visit some of the many souvenir shops in the area. Be sure to see the kitschy Gastown Steam Clock, which releases steam and noise every 15 minutes. If you’re up for some shopping, Water Street is lined with independent boutiques and flagship stores, not to mention countless restaurants and bars. Head over to Chinatown to see the beautiful Dr. Sun Yat-Sen Classical Chinese Garden, and stay for the exciting nightly markets held on the weekends during the summer months. The neighborhood is home to a number of immigrants from Hong Kong, particularly following the handover of Hong Kong to China in 1997. In fact, Vancouver is sometimes called Hongcouver or Little Hong Kong, and Chinatown is at the heart of it all. Victorian Hotel – Victorian Hotel exemplifies shabby chic style, with exposed brick walls and hardwood floors throughout, alongside modern furnishings to perfectly make use of the historic late 19th-century building in which it is housed. There’s a combination of period features and contemporary urban design. A healthy continental breakfast is served every morning. In terms of location, this 3-star option is close to a Skytrain station, plus there many dining options to choose from in Vancouver’s lively Gastown. The West End of Vancouver is one of the city’s most tourist-friendly destinations. It is just steps from the Central Business District Downtown, which makes it easy to access via public transportation. 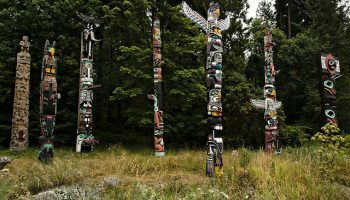 The West End is also adjacent to Stanley Park, arguably the most popular attraction in the entire city. The West End is a combination of modern urban city living and a laid-back beach lifestyle. The neighborhood is diverse, and it home to festivals and music events held throughout the year. Unlike the neighborhood of Yaletown, which is still new enough to be home mostly to young professionals, West End has been around long enough to have residents of all ages, including those who have made their home here for decades. If you want to go to the beach while you’re in Vancouver, staying in West End is a smart choice. You’ll be within walking distance of the busiest beaches in the city, including Second Beach and Third Beach. The Sutton Place Hotel – This is a large, luxury 5-star hotel featuring elegant decor. Staying here means evenings spent reclining by the fire in the classically decorated, wood-clad lounge, as well as enjoying dinner at the gourmet onsite restaurant. The rooms are traditional and come with desks and seating areas. There’s also a spa and indoor pool, along with a Jacuzzi for guests to relax in. You’ll even find a wine shop on the ground floor. Blue Horizon Hotel – The Blue Horizon Hotel boasts large rooms; the higher rooms have great city views. The decor is all about feeling warm and cozy in the middle of the big city. Staying here means being able to make use of the big pool, Jacuzzi and sauna. The location is perfect for those wanting to explore the city: it’s right on Robson Street with plenty of shopping opportunities nearby, plus there’s a free shuttle bus that can take guests to the Capilano Suspension Bridge. Just next to the West End, and very close to Stanley Park, is Coal Harbour. 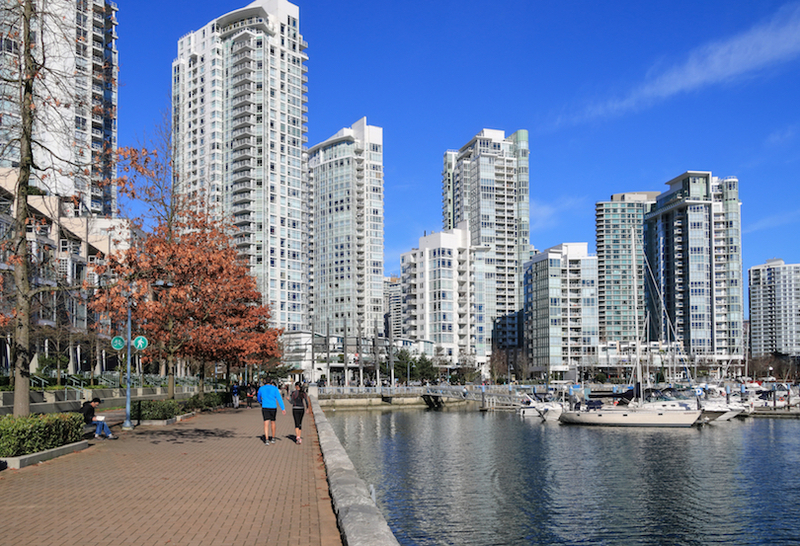 Just like the name implies, the neighborhood looks out onto a body of water called Coal Harbour. If you want to stay in an area with amazing views over the water as well as plenty of history, then accommodation in Coal Harbour is recommended. In the 17th century, Coal Harbour was known as Blueblood Alley, because it was home to many of the largest mansions in Vancouver. Today, there are lots of marinas with houseboats as well as towering condo complexes. It is also just steps from Canada Place, a large convention center, so many business travelers make an effort to stay in Coal Harbour for its proximity. If you stay in Coal Harbour, you’ll also be able to see many of the seaplanes that take off for sightseeing and day trips in the region. If you have ever wanted to take a seaplane adventure, Coal Harbour is the perfect place to try it out. Pinnacle Hotel Harbourfront – Colorful bedrooms with stripy carpets and sundrenched balconies make this 4-star option a comfortable and cheerful place to stay. There’s a bistro bar which provides some tasty meals, but guests can also get room service. There’s an indoor pool and fitness center, as well as a sun terrace that overlooks Coal Harbor. Free bike hire is available, which means you can reach attractions like the Vancouver Aquarium and Stanley Park quickly and with ease. Fairmont Pacific Rim – This luxury hotel provides a high level of service and world of comfort for its guests, meaning your stay in the city will be a relaxing one indeed. The rooms are stylishly modern, spotlessly clean, and boast marble bathrooms as well as stunning views of the coastal landscape. There’s a lobby lounge and a bar, which puts on nightly live music; guests can enjoy a coffee at the in-house cafe, too. 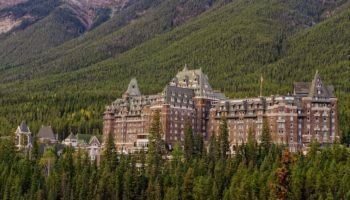 This hotel is an easy walk from Fairmont Waterfront, amongst other interesting places. Kitsilano, known to locals as Kits, was once an enclave for Vancouver’s hippies who wanted to escape the rat race. 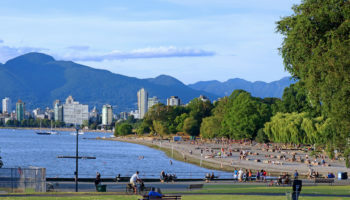 Today, Kitsilano is a popular neighborhood with great access to the beach. 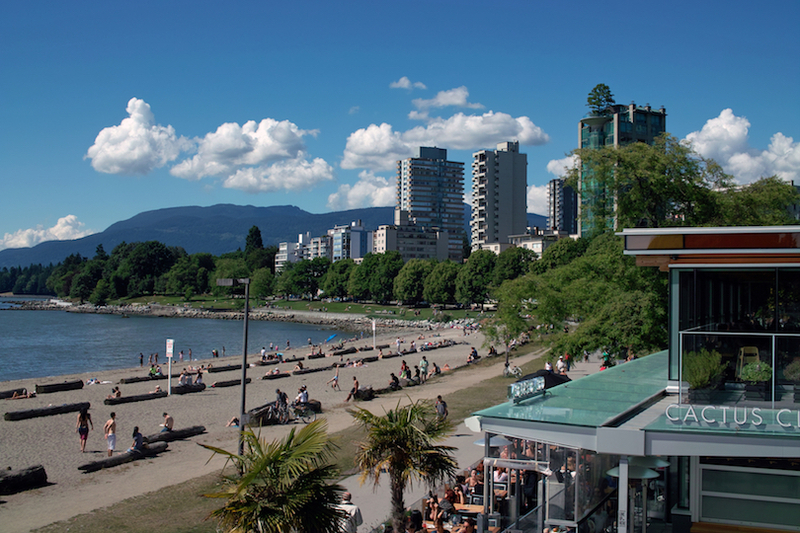 Kits Beach is a hotspot for those who want to unwind on a summer day, soak up the sun and make a splash. There is even a large salt water swimming pool as an alternative to swimming in the sea. Most of the commercial activity is along West 4th Avenue and West Broadway, but you’ll also find shops and restaurants in the areas close to the beach. 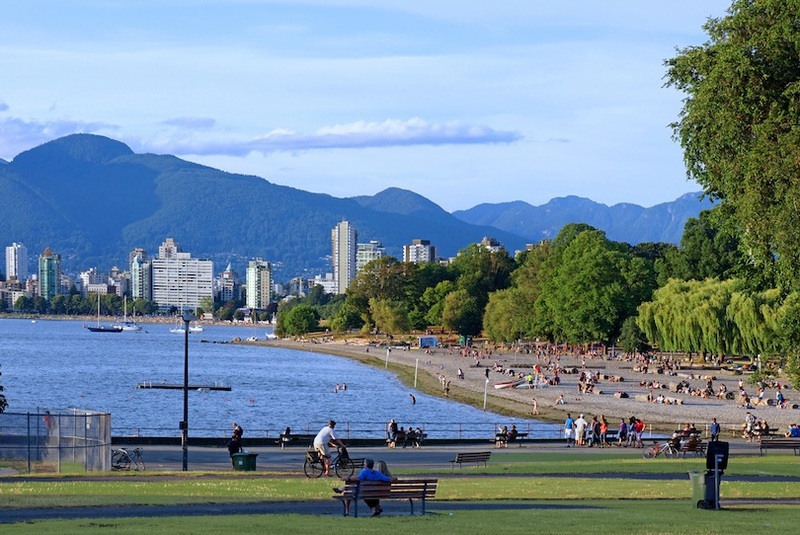 At Vanier Park in Kitsilano, you’ll be treated to amazing views of the city as well as lush greenery and fantastic opportunities for outdoor recreation. Vanier Park is also home to three major museums, each of which definitely deserves a visit. The trio of museums is made up of the Museum of Vancouver, the H.R. MacMillan Space Centre and Planetarium and the Vancouver Maritime Museum. Staying in Kitsilano also puts you close to the art and culture of Granville Island, a must-see destination in Vancouver. Alma Beach Manor – Providing a home away from home, Alma Beach Manor is a comfortable place to stay with a fully equipped kitchen for guests to use, as well as a dining room and lounge. There is a selection of suites available to suit different travelers’ needs, all based in converted heritage homes dating back to 1912. Oozing character and charm, there’s also a pleasant, leafy garden to relax in. There’s even a self-check-in service for added convenience. 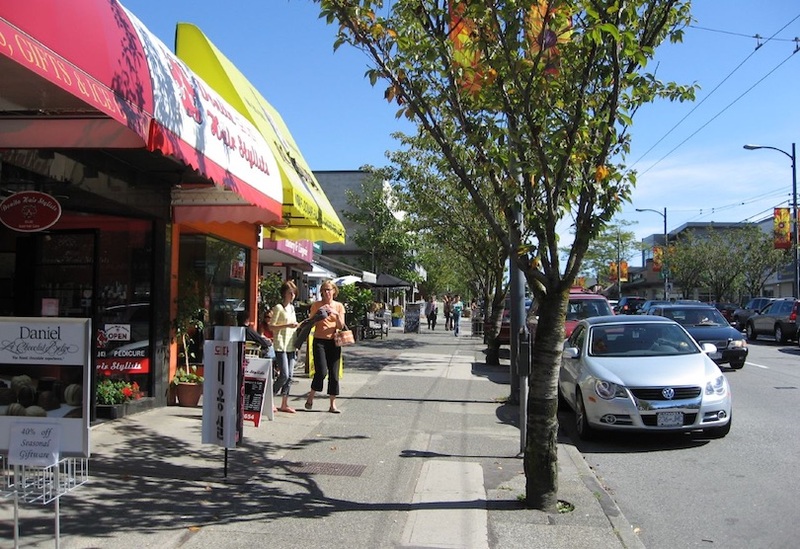 Set in a quiet neighborhood near to Kitsilano Kits Beach, a nearby bus stop provides easy access to Downtown. 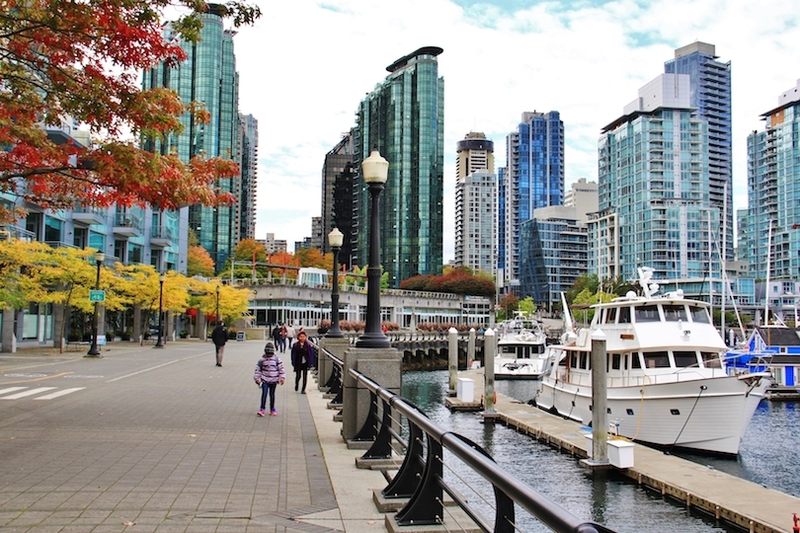 Bordering False Creek, Yaletown is a diverse neighborhood with plenty of culture. Oddly enough, Yaletown gets its name from a town more than 240 km (150 miles) away from Vancouver. When the Canadian Pacific Railway line finally extended beyond Yale and into Vancouver, Yale’s residents made their way to the city and settled in the area now known as Yaletown. For a long time Yaletown appeared run down and was largely abandoned until large-scale development of the area began in the late 1980s. As a result, it’s a youthful and progressive destination. City officials have made sure that developers include plenty of green areas in their plans so there is plenty of parkland in the neighborhood as well as a seawall which attracts joggers and cyclists. At the base of the many new skyscrapers and apartment complexes are trendy bars and shops, putting you within walking distance of plenty of attractions. 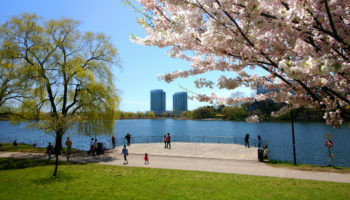 It is also close to False Creek, give you easy access to the famed Science World. Opus Hotel – Colorful, eclectic interiors and funky furnishings collide in an upscale, boutique-style 5-star hotel. In the rooms, guests will find quirky artwork, vibrant color palettes, fireplaces, and bathrooms drenched in light. You’ll also find a chic restaurant, cocktail bar, and fitness center. This is a fun place to stay, surrounded by all the liveliness – and restaurants – that Yaletown has to offer. There’s a Skytrain station within easy walking distance, which makes getting around the city easy. If you want to get away from the hustle and bustle of the city, but you still want to be close to major attractions for sightseeing, then consider staying in Vancouver South. This area is mostly residential, but there are still lots of transport links to get you downtown in a matter of minutes. Vancouver South is also home to a number of older communities, many of which boast historic architecture and beautiful community gardens. Make time in your schedule to walk around the VanDusen Botanical Garden, where you can see a variety of Canadian ecosystems and indigenous plants. Fraser River Park is another popular spot where you can enjoy the outdoors and even watch the airplanes take off and land at the airport. Embrace some of the local cultures of Vancouver South by visiting Punjabi Market, also known as Little India, for some authentic Indian cuisine or clothing. Coast Vancouver Airport Hotel – With simple but contemporary rooms, Coast Vancouver Airport Hotel is – true to its name – set in a convenient position to reach the airport. In fact, the hotel puts on a 24-hour shuttle service to and from the airport, which is only three kilometers away. Fans of shopping will also enjoy the location, thanks to the nearby outlet mall, which the hotel also provides a shuttle service to and from. There’s a 24-hour gym onsite, as well as a restaurant and bar for evening drinks.